1) maintain a respectful distance from the nest and use a super telephoto lens. Ideally, the birds won't even notice your presence, especially if you're partially hidden or camouflaged. 2) keep your visit brief, a few minutes at most. 4) Don't visit a nest more than once a week. 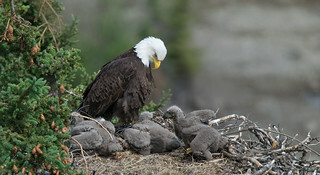 5) If the adults are trying to feed nestlings and are avoiding it, leave immediately.